clay and limestone: Sunshine, There You Are! Peaking out from behind those billowing and beautiful white clouds. To see how their gardens fared in the last deluge. to the ten plus that had fallen on Clay and Limestone. Our state is no longer suffering from a drought. You've made the bees smile. 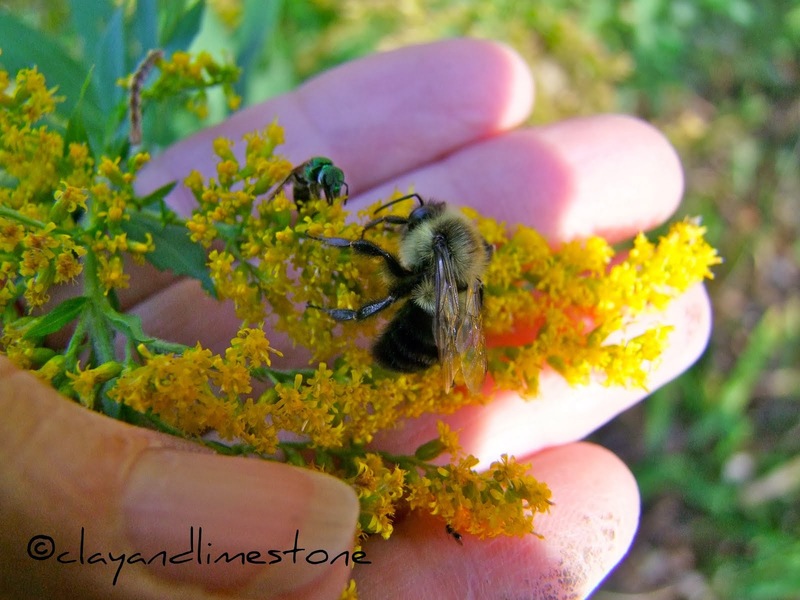 carry the pollen to the next plant. I swear you've made us all happy. taken our manners out of storage. We are celebrating your warm return. Ah! Wasn't it wonderful today! It's what we've all been waiting for. Clay and Limestone looks wonderful. I love your toad lilies. Gorgeous sky! There is nothing quite like the sun coming out after days of gray, dark, and rain. 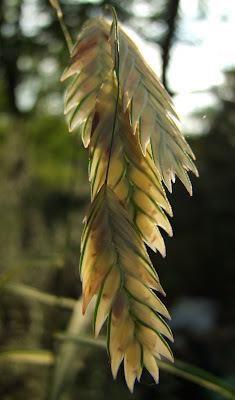 The River Mist Sea Oats are very striking. Have fun playing in the garden! Gail it rained on me something awful on the way back from Raleigh last night. Traffic was crawling at 35mph. Your River Mist is attractive for this time of year and I got to get more salvia cause it's a work horse in the garden. I wish i could do cartwheels across the lawnette...that's how my spirit feels! It's delicious out there...even the mosquitoes can't wipe the smile off my face! Only .4 inches received here since Friday night:( I expected much more especially since I brought plants back with me of course. Sure is a delight to see the sun and your plants love it. Yes, Tennessee bloggers rock! You know how I've always been most proud of our little group! That's wonderful to have the drought end! Now get out there and enjoy the fall sunshine! Congrats on the end of your drought. We had some nice sun here this afternoon, too. It sure makes a difference after the run to see the sun shine! What a relief, the drought is over, and the sun is back! 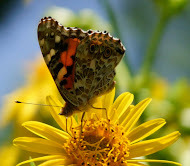 I love your photos, especially the early one in the post of the sun passing through the asters. Of course I always enjoy the ones with insects, too. Gail, I was glad to hear you've been getting rain... and that's a LOT! ;-) However, you really needed it. Love your 'Empress' tricyrtis. It's very pretty! I visited my parents all last week (No. Iowa) and returned home Saturday evening. I've just finished a number of posts! ha. I'm so happy you're no longer in a drought. Everything (including the gardeners) will be much happier now. I'm still waiting for my Tatarian Asters to start blooming. Any day now. It was about time! I spent a good chunk of the day enjoying the sun in the yard. Now let's just hope this lasts for a while! Hi Gail, we never miss our water 'til the well runs dry, in reverse! The sun never seemed more beautiful, the sky more blue, the garden more grateful than after these torrential rains. Your garden is lovely. It's sunny this moring, but we FINALLY got a lot of rain last night. YAY! And it's cool! Perfect weather for transplanting a little later today. Fifteen inches, whew! No wonder you are glad to see the sun. And here we are celebrating the 2 1/2 inches we got last week! Just like you, I raced out yesterday afternoon once it cleared to see what's new in the garden. Everything looks so lush and green, and many flowers decided to rebloom. Too bad they'll get zapped by frost before too long! So the spotted flower at the end is a toad lily? What beautiful blue skies! Everything does look happy to see the sun, especially those hungry bees! Over how much time did you get that much rain? Gorgeous photos. Love the warm golden tones from the sunshine! PS I especially love the photo of the bee clinging to the Coral Nymph salvia, and the bee peeking through the aster. Wonderful! Wow, that is a lot of rain. I am so glad your reservoirs are full and your garden survived the refilling. It looks like your garden is awash with bees now. I love the one with the bee on the aster. It screams welcome fall. And congrats on your award nominations -- and good luck! How strange to look at your beautiful sunny sky photo and hear the rain outside my window. I'm happy for you, and I'm happy for us! We've got a long ways to go to get out of our drought problem. I know exactly how you feel (and I felt a little ungrateful too) but there is just something about sunshine that puts a bounce in your step. I'm glad you received some much needed moisture and can now get back outdoors. Your photos always make me smile. Hi, Just dropping by from blotanical, Those lovely asters certainly make those bees happy. You have a lovely blog and I find myself visiting it often. Thank you for sharing. I've add it to my blog roll.